Murrieta Valley QB Hank Bachmeier has the opportunity to take the Nighthawks to heights they have not reached in a decade. There was a time, over the course of a few seasons in the middle of last decade, when there was a tussle for dominance in the Southwestern League. Those days were fun but let’s face it: that was a long time ago. Coley Candale and Vista Murrieta have run off a string of consecutive titles with no signs of slowing. Until Candaele resigned his football duties at Vista Murrieta. Boom. Era over. Door open. 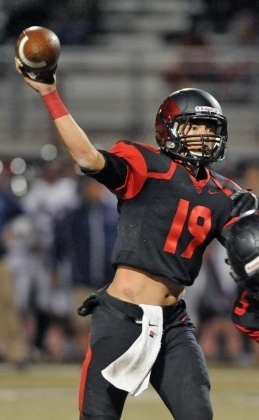 Enter Murrieta Valley super sophomore QB Hank Bachmeier? Can the brilliant young signal caller and the Nighthawks dethrone their cross-town rival? Murrieta Mesa has been on the rise the last years. What are the Rams capable of this season? Are Temecula’s programs losing relevance? This is a league facing plenty of questions. VISTA MURRIETA (12-2 overall, 5-0 SWL) is really dealing with an elephant in the room. How well will they do without Candaele prowling the sideline? The Broncos are cool with long-time assistant coach David Olsen in charge, but change is always hard. Senior QB Karson Greeley has a big-time arm and big-time potential, an uber-familiar connection with senior TE Kade Greeley, and his backfield teammate, RB Cole Dubots, is tough to tackle. MURRIETA VALLEY (9-3, 4-1) has a prolific passing offense. Bachmeier and receivers Marquis Spiker and Maurice Bell open up defenses, dominate scrawny defensive backs and will score loads of points. The Nighthawks’ only league loss was to Vista Murrieta (35-7 in Week 7), but now they have a real shot at becoming new kings of the SWL if they can find defensive stops, and an effective running game. TEMECULA GREAT OAK (5-6, 3-2) seems a willing participant in a chase for a playoff spot, and a lot will be riding on the play of senior QB McGwire Bustamante. The 6-foot-1 righty came on late last season, but will need to be more efficient if the Wolfpack are to hold on to the SWL’s third spot. MURRIETA MESA (5-5, 2-3) produces some the Inland area’s best lineman, and protecting the Jeff Miller-to-Jacob Ray connection will be essential to this year’s offense, but are the Rams ever going to produce a playoff-caliber defense? TEMECULA CHAPARRAL (3-7, 1-4) are all about the prolific Michael Onyemaobi (6-foo-2, 190 pounds) this season. Can coach Jeremy McCullough ride ‘Yo-Yo’ to the playoffs? TEMECULA VALLEY (4-6, 0-5) were 4-1 before the collapse. Any reason to expect different this time? Aug. 26 — Temecula Great Oak at Menifee Heritage, 7 p.m.
Sept. 9 — Vista Murrieta at Corona Santiago, 7 p.m.
Sept. 16 — Murrieta Valley at Rancho Cucamonga, 7 p.m.
Sept. 23 — Temecula Great Oak at Upland, 7 p.m.
Oct. 21 — Vista Murrieta at Murrieta Valley, 7 p.m.